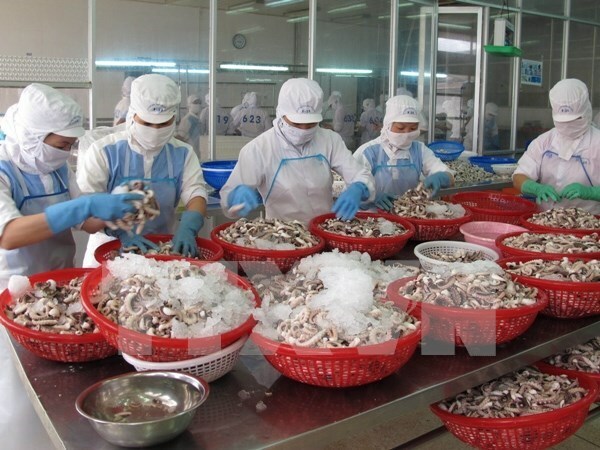 Hanoi, (VNA) – The Purchasing Managers' Index (PMI) of Vietnam dipped to 50.3 in February, down from 51.5 in January, but remained above the 50.0 no-change mark, according to a Nikkei report released on March 1. February saw a further modest improvement in business conditions in the Vietnamese manufacturing sector, as growth continued in output, new orders and employment. But the respective increases in each of these areas were weaker than seen in January. Meanwhile, lower oil prices contributed to a sharper reduction in input costs, while output prices decreased again. The health of the sector strengthened over the last three months. But the latest improvement proved the weakest in this sequence. Vietnamese manufacturing output increased for the third month running, albeit only slightly and at a weaker pace than in January. This slowdown helped lead to a reduction in the stock prices of finished goods as firms used inventories to fulfill new orders. Moreover, post-production inventories fell to the greatest extent since February 2014. A slower rise in new orders was recorded in February. Where new business increased, improved customer demand proved responsible. Meanwhile, new export orders also rose, and at a slightly faster pace than in the previous month. More new orders contributed to a second successive monthly accumulation of outstanding business, although the rise in February was only fractional. Similarly, employment remained broadly unchanged during the latest survey period, as hiring in support of production growth at some firms contrasted with resignations at others. Input prices fell at the fastest pace in three months in February, extending the current sequence of deflation to eight months. According to respondents, lower oil prices was the main factor leading costs to decline. Both the intermediate and investment goods sectors posted falling input prices. In response to falling input costs, as well as to fragile client demand, manufacturers lowered their output prices. The latest decrease was solid, but reflected the slowest decline since last July. In line with the trends for output and new orders, purchasing activity rose at a slight pace visibly weaker than in the previous month. The Vietnamese manufacturing sector saw growth weaken in February, as fragile global demand hampered efforts to sustain the momentum gained at the start of the year, according to Andrew Harker of Markit, which compiles the survey comments on the data.